A Castle Of The Occult On Rittenhouse Square | Be Kind. We're all in this together. Step inside the slender turn-of-the century castle at 1917 Walnut Street, built for John Wanamaker’s brother William, and you enter a world of ornate plasterwork and wood paneling. Sound is muffled here–the place has the hushed air of a library, or perhaps a monastery. This fervid Rittenhouse Square spring might be a thousand miles, a thousand years away. There are few religious symbols to be seen, but the home of the Philadelphia branch of the United Lodge of Theosophists certainly feels like sacred space. Indeed, for more than a half a century it has been home to followers of Theosophy, a spiritual philosophy developed by charismatic occultist Helena Petrovna Blavatsky that believes in reincarnation, and the presence of divinity in all people and all things. Though their numbers are few, Theosophists have had an outsize influence on American culture as the forerunners of today’s New Age Movement. 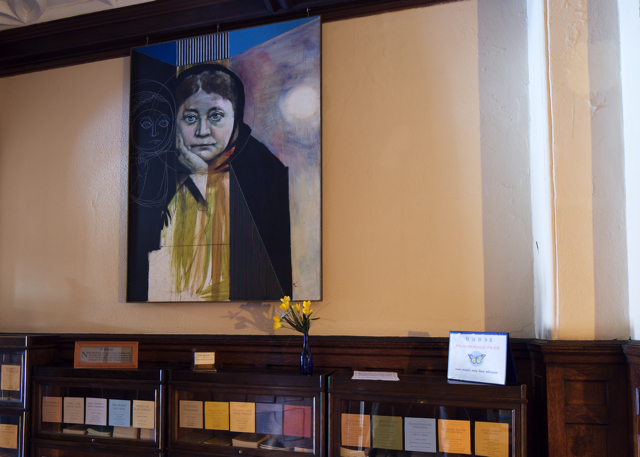 The Lodge has been at this location since 1948, but Theosophy itself was born in Philadelphia, in 1875, in a little house on Sansom Street in West Philadelphia where Madame Blavatsky laid the groundwork of a worldwide movement. Madame Blavatsky first came to Philadelphia in November 1874. Born to minor nobility in the Russian Empire, she had a magnetism that made converts out of skeptics. She had come here to defend Spiritualism, which had been under attack in the press. Spiritualism is the belief that ghosts can communicate with the living through a special person who can summon them called a “medium.” This takes place in a session called a séance, usually held in a darkened room. Blavatsky called herself a Spiritualist, but she was more interested in studying “the other side” than in talking to people’s dead grandmothers. There were about 300 mediums in Philadelphia in 1874, but two of them, Nelson and Jennie Holmes, had unleashed a scandal that threatened the whole profession. Six months earlier, they had begun holding commercial séances at 50 N. 9th St, where “spirits” would appear in a large cabinet, showing just their faces or hands. These particular spirits called themselves John King and Katie King. John King claimed to have been the pirate Henry Morgan in life, and Katie King was his daughter. Katie would sometimes emerge from the cabinet, and male visitors remarked upon her graceful figure. You could buy photos of the sultry spirit afterwards. Clearly, this was fraud. But it convinced a lot of people, and the contested reality of “Katie King” consumed a lot of newspaper ink. It was then that Blavatsky came to Philadelphia to investigate. She quickly discovered that the Holmeses were con artists, but felt compelled at first to defend them anyway. Blavatsky had misgivings about popular Spiritualism, but was far more worried about the spread of skepticism. If Spiritualism was discredited, she feared that the public would lose faith in the existence of the soul and the afterlife. 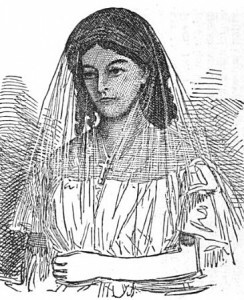 In early January 1875, a newspaper reported proof that Katie King, at least, was a hoax. 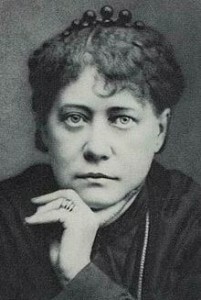 Despite this, Blavatsky, along with her friend, the famous journalist Henry Steel Olcott, defended the Holmeses in a series of fiery articles. While all this was going on, Blavatsky’s life took a turn for the surreal: matrimony. She had caught the eye of Michael C. Betanelly, a mentally unstable businessman from Georgia. After four months of rejection, he threatened to kill himself if Blavatsky would not marry him. She reluctantly agreed and they were married on April 3rd. The couple moved into a rowhouse at 3420 Sansom Street, which would become the base for their pro-spiritualist campaign. (Since the 1980s this has been the home of social entrepreneur Judy Wicks and the restaurant she founded, the White Dog Cafe, named for Blavatsky’s dog.) The newlyweds were not the only inhabitants, however. Blavatsky, Betanelly, and Olcott all attest that the spirit John King was real, and haunted the Sansom Street house. They claimed that the old pirate ghost would get frisky with Blavatsky, calling her “my fine Spanish wench,” and “a regular foreign pop-gun.” It appears Blavatsky was convinced of the spirit’s reality. Meanwhile, the Holmeses’ fraudulence was becoming harder to ignore. The last straw came in mid-April. The Holmeses appealed to the Spiritualist community for money to defend their reputation, and then bought themselves a horse and buggy. Furious, Blavatsky disowned them, writing that “Mrs. Holmes is the biggest fraud of the age of Spiritualists.” By May, Blavatsky despaired that the public had lost faith in Spiritualism, thanks to the Holmeses’ antics. So, too, had Blavatsky. Though bedridden with a gangrenous knee, she wrote and published a series of articles criticizing Spiritualism. She denounced it for meddling with dangerous spirits and also for missing the point: the spiritual side of life should be studied, she argued, not made into a carnival attraction. More importantly, in a stream of letters, she laid out the basic tenants of Theosophy. It seems that Blavatsky’s disgust over the Katie King affair had spurred her to break with Spiritualism and lay out her own system. Though Theosophy draws from many religions, Blavatsky drew most heavily on Hinduism and Kabala. “These were not her ideas,” says Leslie Royce Pochos, who has been involved with the movement since 1970. “This was what had been given to her by human beings that had encompassed the divinity of their natures.” Theosophists believe that every human soul is part of a great “Universal Oversoul,” which permeates all matter, animate and inanimate. They believe each soul is reincarnated endlessly as it evolves toward perfection. This progress is measured by compassion and service to others, the true nature of the soul. Royce Pochos was drawn to Theosophy by its non-judgmental attitude. “I was always looking for something that didn’t reject anybody,” she said. Theosophy has no commandments and no sins. It holds that karma will provide the right reward or punishment for your actions. Nor is there a priesthood, as Blavatsky thought that everyone must come to the truth by their own independent studies. This egalitarian spirit lives on today at The United Lodge on Walnut Street. The Lodge has no officers and no charter. “We’re not an organization,” says Royce Pochos, “We’re an association of students.” The goal of the United Lodge is to distribute the literature and ideas of Blavatsky and Theosophy’s other founder, William Q. Judge. To this end, the Lodge sells the founders’ books at a reduced price, and maintains a free library. They also hold free weekly lectures and discussion groups on Theosophy and world religions. The lectures are available online as a podcast. So what was Blavatsky’s karma? By June her knee had healed up, with the help of a white dog that lay across her leg as she slept. Her marriage, however, was in need of amputation. Blavatsky refused to live with Betanelly ever again, and in August he divorced her. Eager to get away from him, Blavatsky moved to New York City and on September 7th, 1875 she founded the Theosophical Society. This entry was posted in Uncategorized and tagged CENTER CITY, MADAM BLAVATSKY, Nancy Bragin, OCCULT, RELIGION, RITTENHOUSE SQUARE, Theosophy, UNIVERSITY CITY, WALNUT STREET, WEST PHILADELPHIA. Bookmark the permalink.